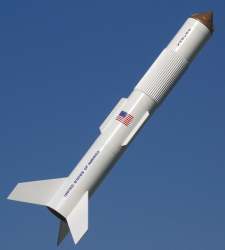 I've built or helped build three of these, and launched two of them. They are great fliers, but out of two launches I've seen two lawn darts. I did fit all of them with plastic streamers, as much to aid tracking as anything (but obviously that didn't help since they never deployed). I think I'm going to remove the streamer from "my" Six and fly it that way. Maybe it will work. This is one of my rockets from my "first period" of building and flying. I actually built two of these, thinking the second would look better than the first. I think I might actually be able to build one correctly now, but of course they no longer sell them. Still, it was always a crowd-pleaser, and it remains so today. 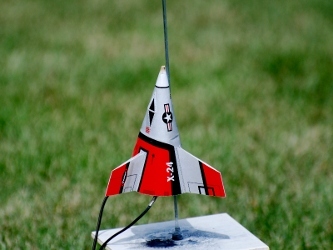 I built this rocket around 1980 or so; it was one of the last I built in my "first period" of rocketry. It is one of the few that survived in storage well enough to refurbish; of course, the parachute and shock cord had to be replaced (I made a parachute from aluminized mylar, and replaced the rotten rubber cord with a new piece of elastic). And, of course, I repainted it. It flys quite well, though the larger parachute does tend to make it drift. 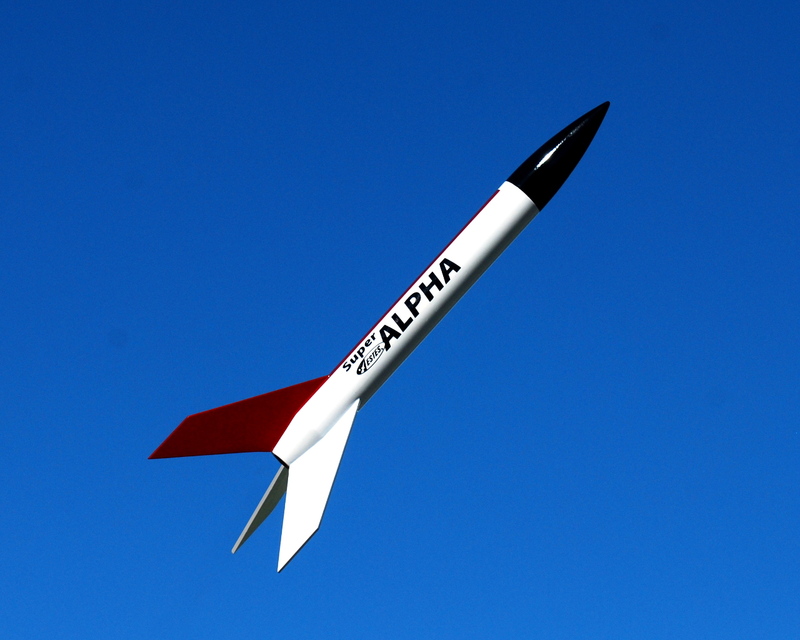 This is my "Alpha Experimental" as detailed here. 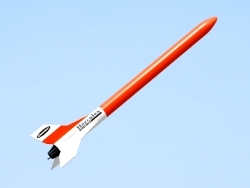 Here's my stock Semroc Astro Jr. I'm really happy with how well the decals went on, and how well the Kilz CraftCote Apple Red matched them. I got an Astron Mark kit from Semroc last year. I knew it would be good flier, and hard to prep (due to the short body tube), so I fitted it with a mini-engine mount. 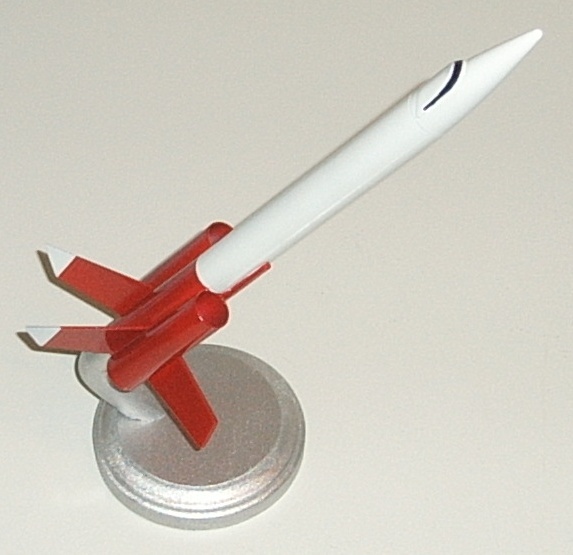 After doing a right fine job (if I do say so myself) in priming and sanding and putting on a nice white basecoat, I Easter egg painted it (spray paint on water, then dunk the rocket). Well, not only did it not come out as pretty as the web images that gave me the idea, but also the water soaked into the body tubes really fast. I barely got the swelled engine casing out in time, and in fact, the engine tube is more than a bit mangled at the lower end. So I let it dry out, nose cone removed, cursing myself for a fool. When it was entirely dry I discovered that, despite the damage to the engine tube, I could still mount an engine in it. So I stuck in an A3-4T and added a decent streamer, and off it went. It really got up there for such a small engine, and the streamer popped perfectly and it descended within the yard. Of course you know, with all the damage it has suffered, and ugly as it came out, I probably will never lose it. No matter how bad I'd like to. Here's one I bought back in October or November 2006. I built it pretty much according to plan... but then I built another (see below). In the category of not leaving well enough alone, I purchased a second Baby Bertha and modified it. This model now has a 2x18mm cluster engine mount, with Kevlar shock cord attached directly to it. 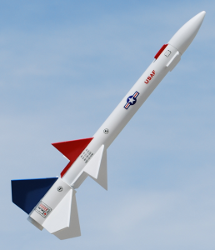 The nose cone required weight to make the rocket stable with two C engines; my thanks to CPMcGraw of Ye Olde Rocket Forum for putting it through RockSim for me, as I could have figured out the nose weight but would have used the wrong engines. 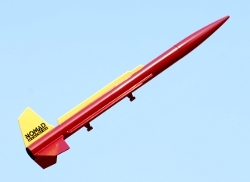 This model will fly on 2 each A8-3, B6-6, or C6-7 engines... I'd have used C6-5's and the parachute would have gone to shreds. Update 10/3/2010 I've put this rocket through OpenRocket 1.1.2, and as you can see from the table below, the engine issue isn't as clear-cut as we previously thought. 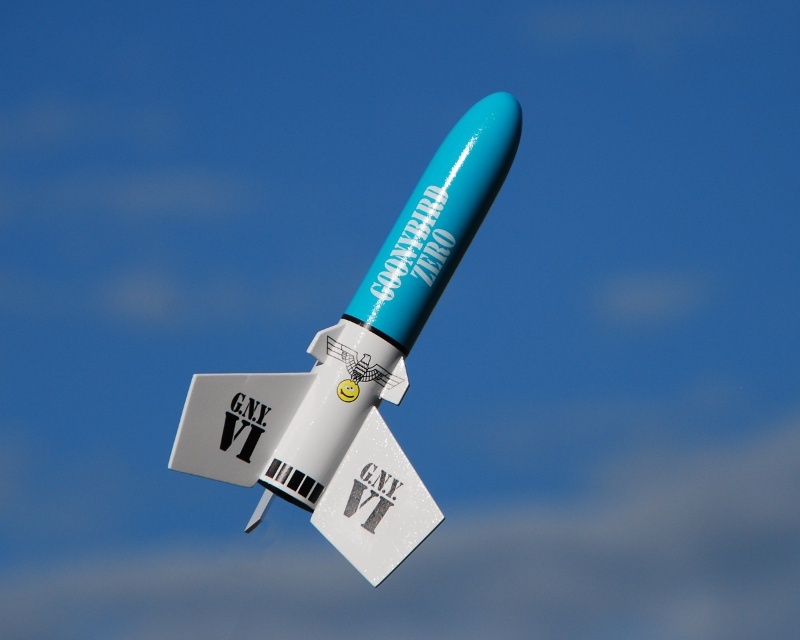 Experience tells me that C6-7 engines work fine, but the deployment does tend to be late. I may try C6-5 engines on a future flight. This monster is inspired by another three-cluster with fins between the engine tubes. When I was designing it, naturally I wanted a baffle, and as I thought it over, I realized I could build a baffle using three tubes that could be exposed to view. Thus was Baffler invented. 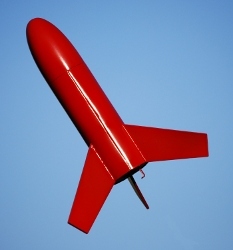 The BT-60 tubes were taken from two Baby Bertha kits I raided for parts, and the nose cone from a Patriot. 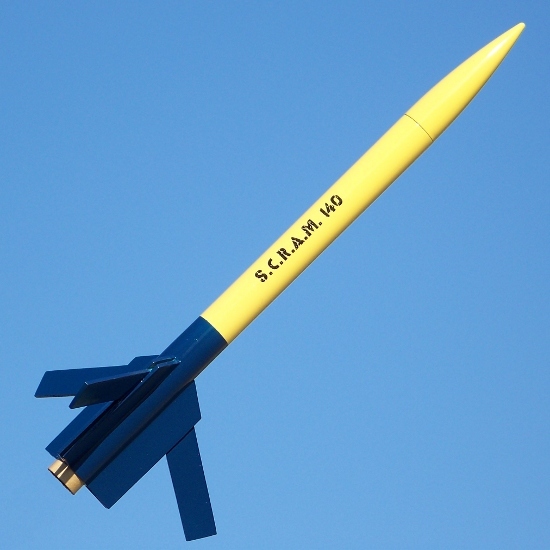 Most of the rest of the parts came from Semroc, of course. 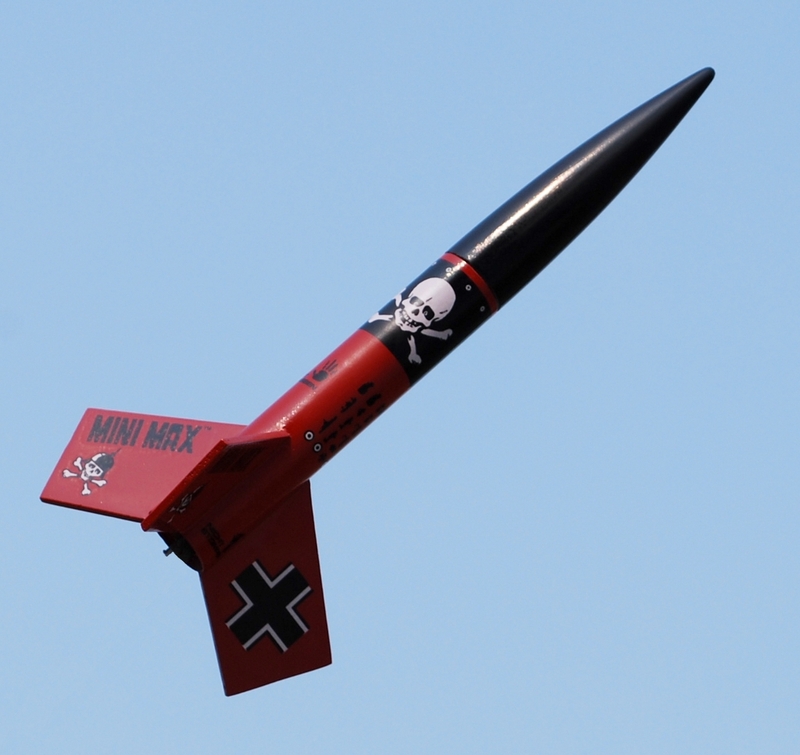 09/20/2015 3x C6-3, Early deployment as expected, short zipper, destroyed chute, cracked fin, but will fly again. This is my clone of the old Centuri Bandito. 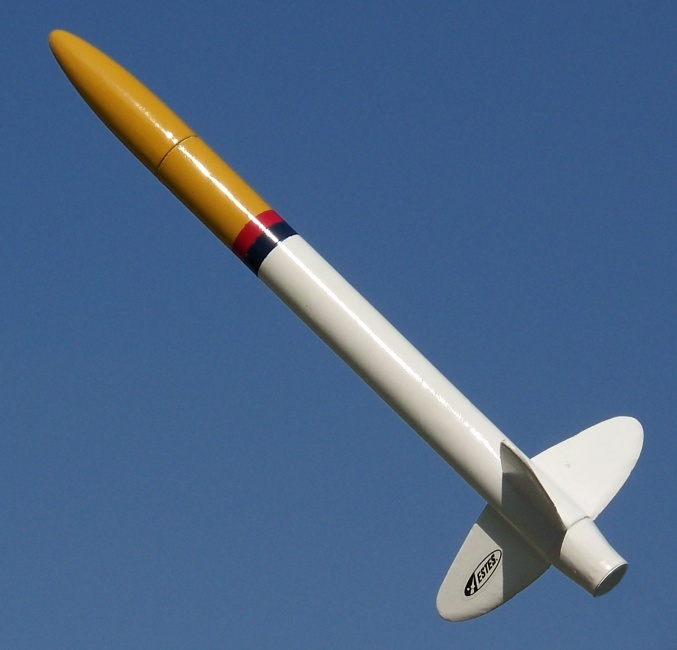 I built it entirely out of Estes parts, and it consists of a single body tube instead of two tubes connected with a coupler, but it is almost exactly the same dimensions as the classic rocket. I have a page about this rocket build; click here to read more. 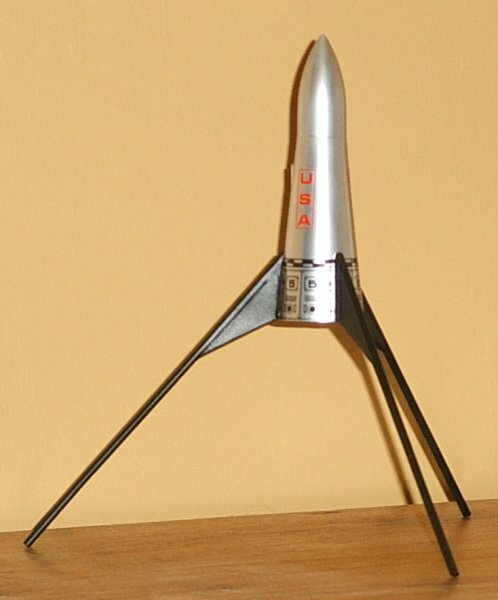 This is just something I threw together out of two Baby Bertha kits, a balsa bulkhead, and a handful of dowels. The second picture shows Betsy after being refit as a camera carrier, and of course, after replacement of the lost nose cone. I built this Big Daddy to fly on a cluster of 18mm engines, which I have lots of, rather than a single 24mm engine. I have a page detailing this rocket build; click here to read more. 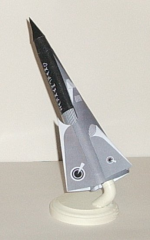 This is the first of two clones of the old Centuri Vulcan I have built (see also the Paper Black Vulcan below). This rocket was an Valentine's day gift from my daughter Taylor. I loved building this rocket, but the stickers have been a challenge for me; in fact, I have pretty much ignored most of them. 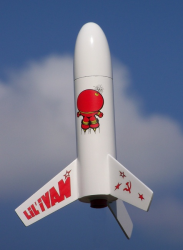 Self adhesive stickers just don't look as good as decals, especially when you put a bunch of them on a rocket, so I chose to limit myself to those few that were really needed. The "belts" around the rocket are painted on. Those stickers that I did use, I applied over a wet coat of acrylic gloss varnish (the type in the small bottles that are used in craft projects), wiping off the excess varnish after lining up the sticker. A sticker applied to wet varnish will slide around like a decal, and it is much easier to work the bubbles out. Update: As you can see from the picture at right, the Bullpup is not painted the colors described above. I clearcoated it, you see, and the clearcoat ate the paint. I was so ticked off... so when I redid it, I went with green and black and used Future for my clearcoat. I designed and built this rocket during the 2006 World Series, as I sat cheering my favorite baseball team. My protege Justin and I had each purchased Quest Flash kits during the Hobby Lobby closeout sale; I decided, as his was pure stock, I'd customize mine. This is a scratch design of my own. I have a build page on it here. * I am almost certain this is wrong. 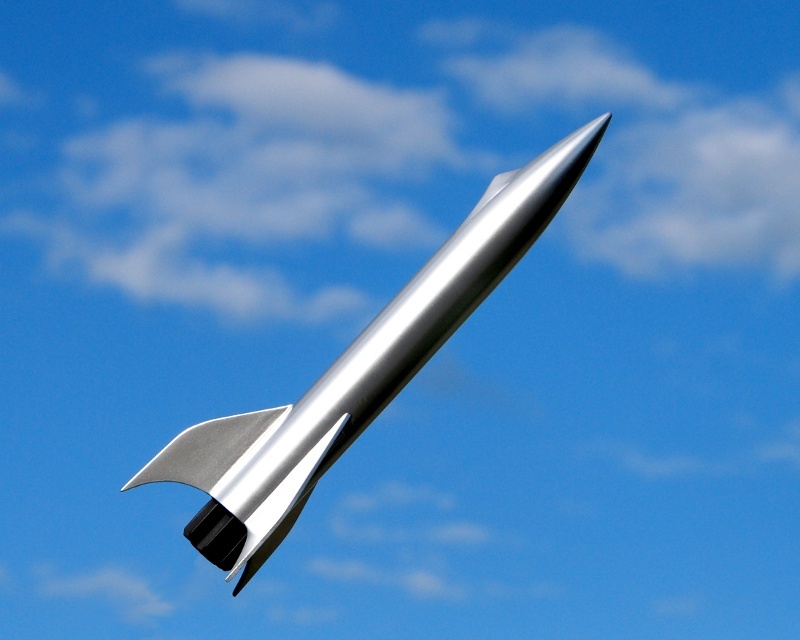 Perhaps my build is heavier than the simulation indicates, but deployment is near or just past apogee with a C6-3 engine. 09/27/2008 B6-4, chute tangled in fins, crashed. 07/03/2010 C6-5, deployed very very late (10' from the ground), no damage; updated recommended engines. 09/18/2010 C6-3, deployment perfect, recovered fine. Here's my Quest Cobalt. 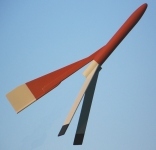 I built it to fly on mini-engines, mainly to leave room for the streamer inside. 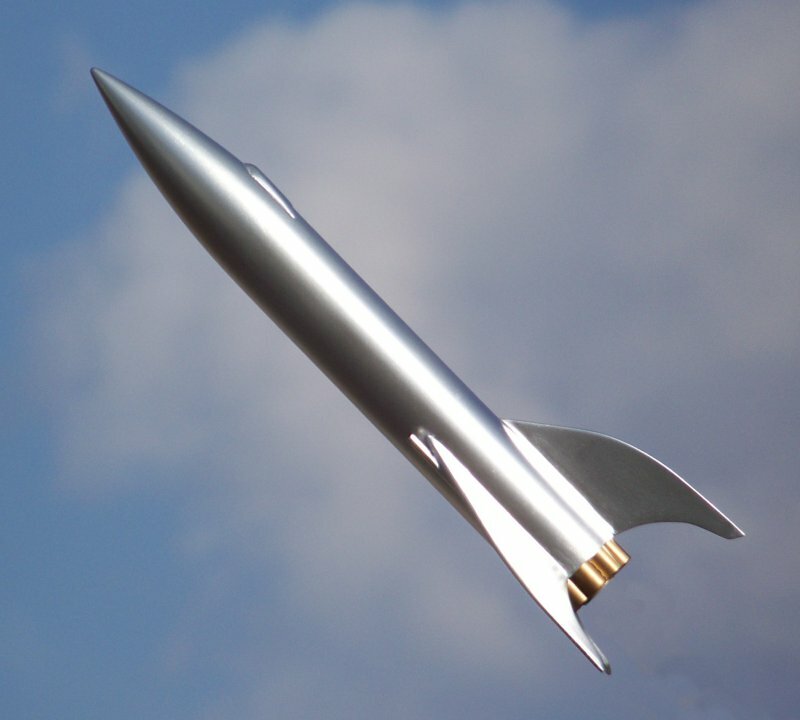 This is my version of Jonathon Mills' Cyclone rocket. It's pretty cool in flight. As you can see, I painted mine; it still gets a hang time around 15-25 seconds. I have a page about this build, including my rendition of the plan. Click here if you are interested. 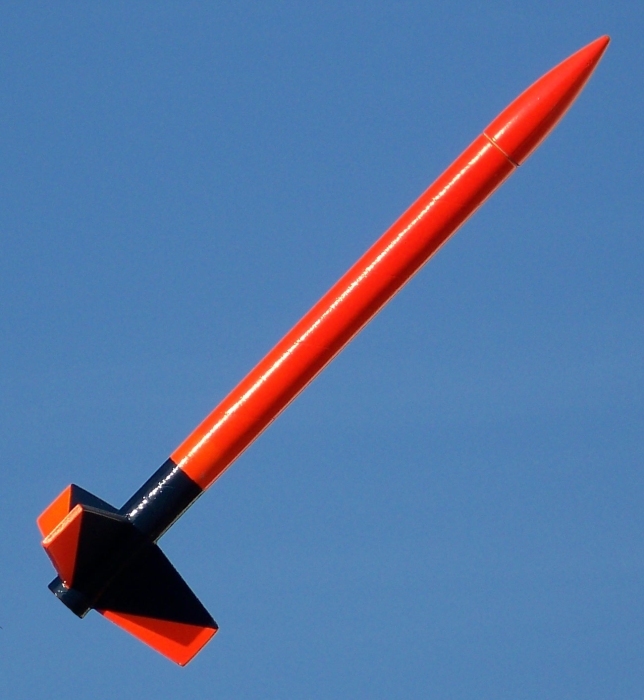 1/2A3-4T, A3-4T; I've flown it on A10-3T without trouble. 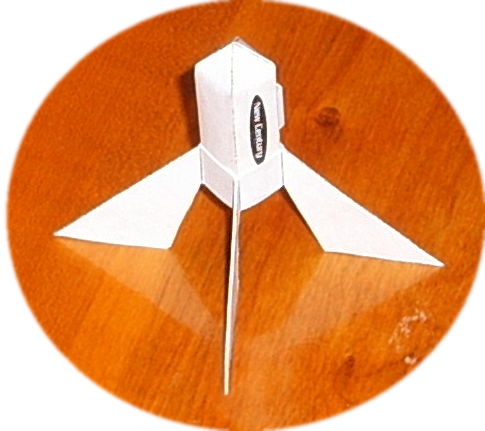 I built this as a classic sci-fi design using a Baby Bertha kit, a nose cone and coupler from an Estes Patriot kit, and 110# paper rolled around a dowel for the "rocket tubes." The engine mount ejects on this model, rather than the nose cone, allowing me to eliminate the "visible nose cone line" (VNCL) which is so prominent on other sci-fi models. Update 05/15/2008: My Dawn Star got lost in a wheat field on its second flight. This is the replacement for my lost Dawn Star, above. I changed the rear ejection mechanism to be similar to my very reliable Mo' Skeeter, and at the same time decorated the engine mount with vanes rather than tubes. I picked this one up while passing through St. Louis; I had never seen one like it. Not surprising, I later learned, as I was able to find it in the early Quest catalogs on Ninfinger's site, but not on the current Quest website. 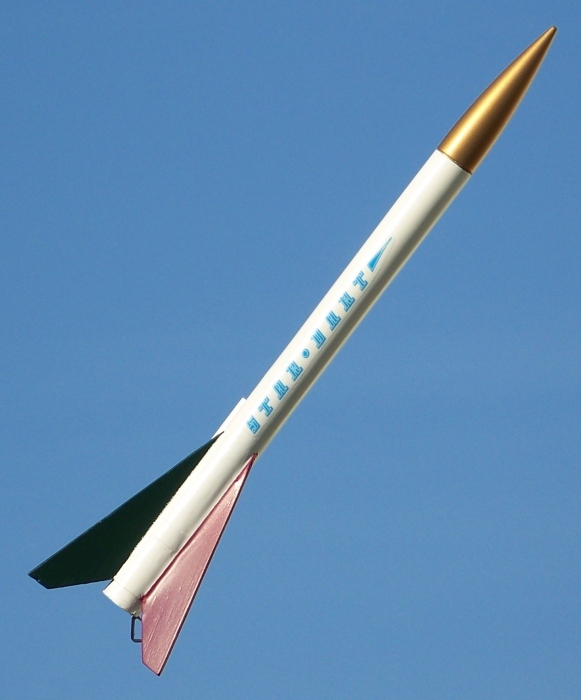 This rocket was my Father's Day 2007 gift. It was an easy build, but I really like how it came out. I love that aluminum-and-flat-black paint job (obviously, since this is the second I've painted that way). Update 08/12/2007: Sadly, my Galileo went MIA on its first flight. Update 06/10/2008: File this in the "so I don't know when to quit" department. 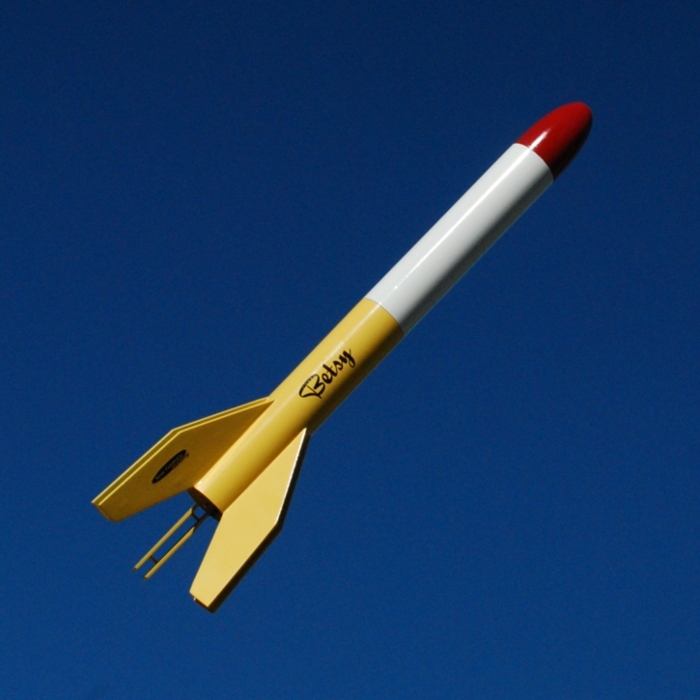 I've built another Custom Galileo... see below. Update 07/19/2009: ... and I've lost it. See below. Here you see my second Custom Galileo. Here's my Goonybird Zero. I had trouble with the decals... I tore up both crosses trying to position them. Gah. 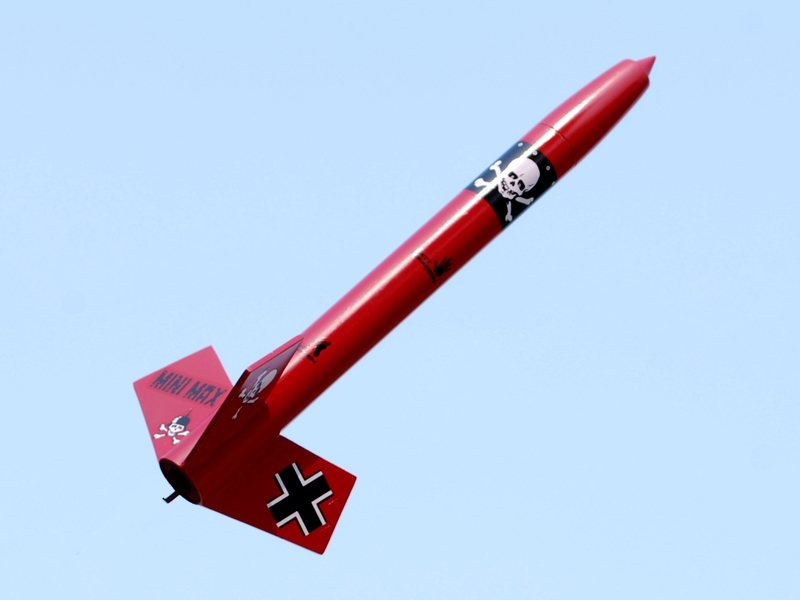 Note that this one has the same rear ejection system as my Mo' Skeeter. 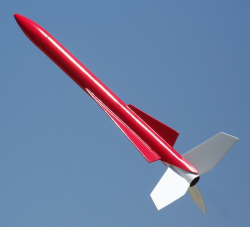 I bought this rocket in the Fall of 2006 with some birthday money, and it seemed like I spent forever priming and sanding it... I began to wonder if I would ever get the spiral groove filled. But it seems to have turned out quite well, if I do say so myself. I picked this rocket up off the rack at a hobby shop in St. Louis years ago, and finally got around to launching it in 2015. For a draggy rocket, it's a pretty good flier. 09/20/2015 C6-3, chute stuck, cracked fin, will fly again. 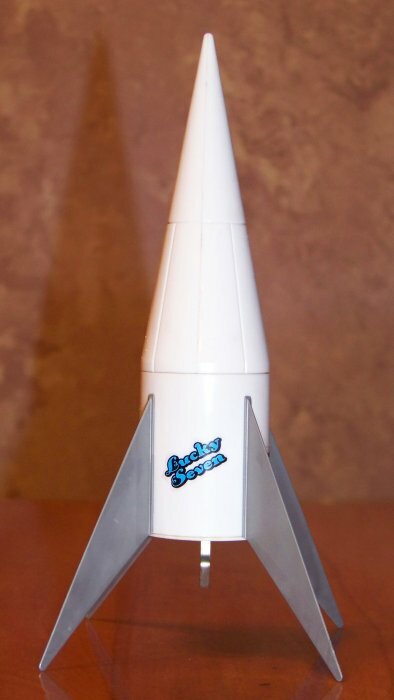 When I saw the Stellar Hercules in the 1975-76 Rocket Times on Ninfinger's site, I knew I had to have one. 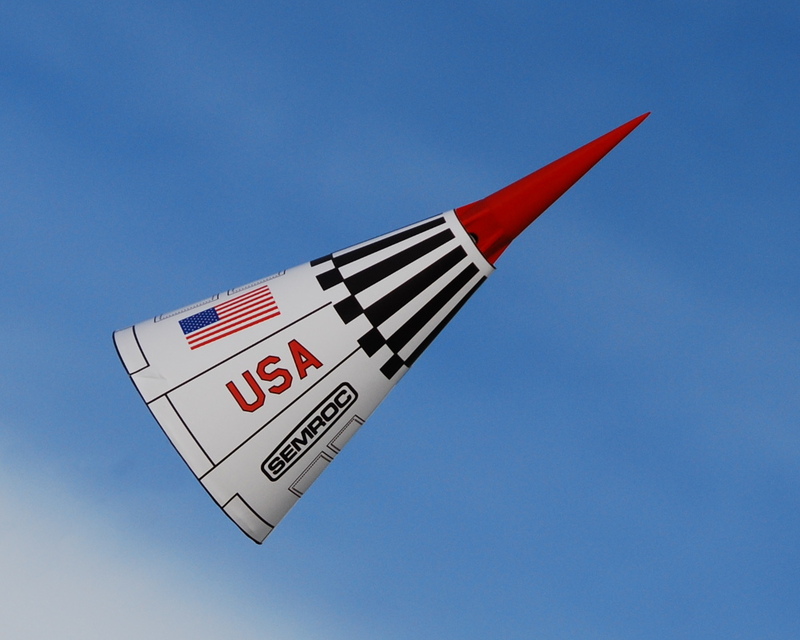 Thanks to Semroc, I was able to get a nice laser-cut fin set and all the necessary parts; I added one of Carl's baffles to allow quicker turn-arounds. I can't wait to launch this one. 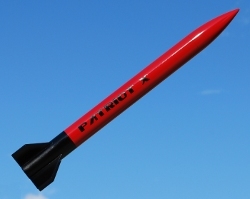 Update 6/19/11: Owing to the late deployment issue at the 4-H launch (see link below), I've revised the recommended engines for this rocket. Update 4/25/12: I've simulated this rocket and updated the recommended engines again. It's a choice between late and early deployment, I'm afraid. I'm really happy with the way this one came out. 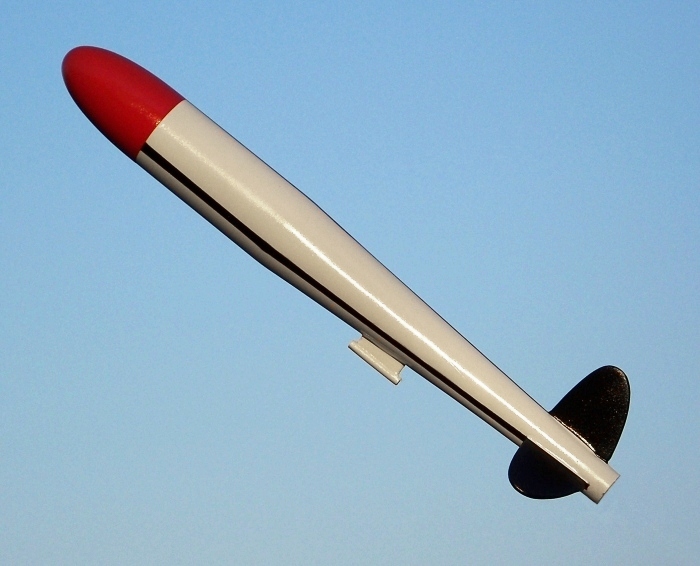 I scratch-built this clone of Centuri's old Lil' Ivan using decals and fins from Semroc and a nose cone, body tube (cut down, of course) and engine mount from an Estes Baby Bertha. Lil' Marvin is my "version" of the classic Lil' Ivan (see above). It goes to pieces under pressure. 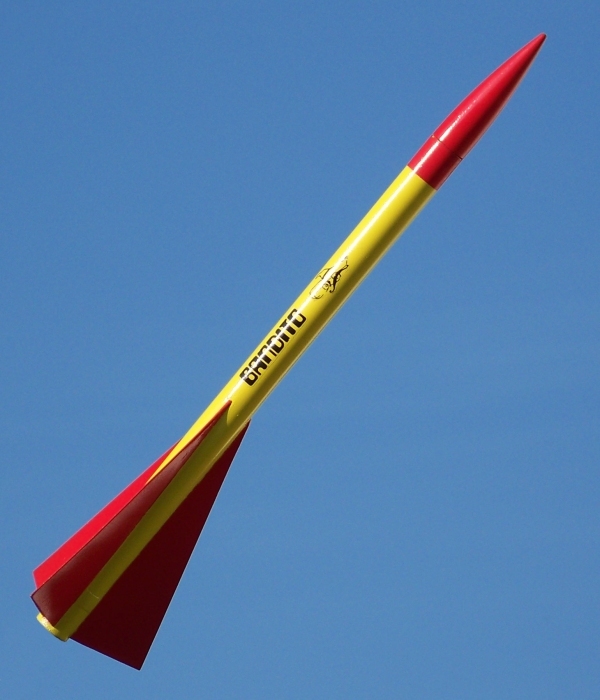 Most parts came from Semroc, except the plastic nose cone, which came from an Estes Baby Bertha kit. 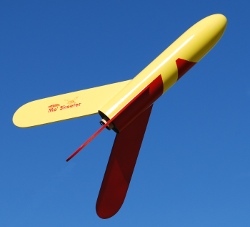 This is my modified Hi Flier; I fitted it with a 13mm engine mount. As Hi Fliers are known for stability issues, I put a single computer screw and some polyurethane glue into the tip of the nosecone; according to OpenRocket, I shouldn't need any at all, but I was being careful. 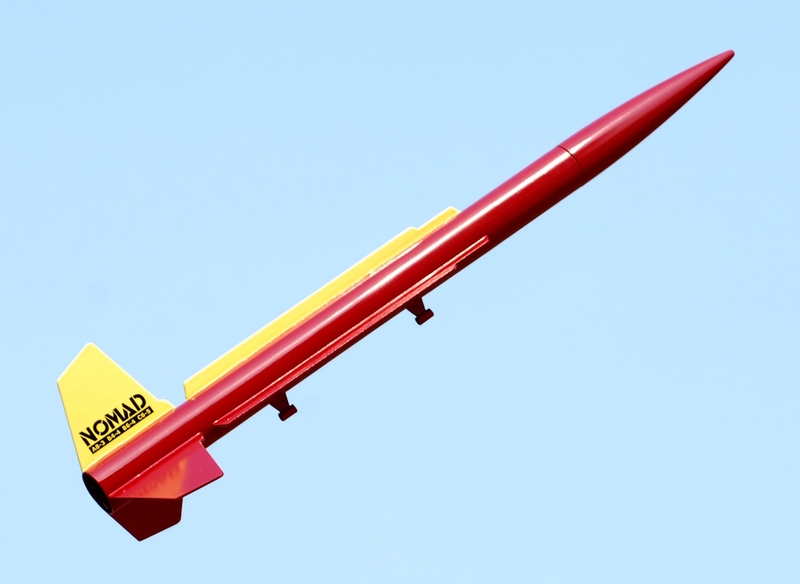 This rocket consists of the fins and nose cone from my Lil' Marvin combined with a selection of spare parts. I just wanted a back yard flier to burn up my large collection of A10-3T engines. Seems I succeeded. 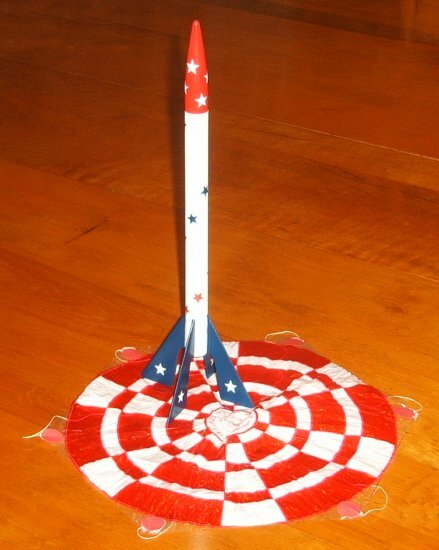 I bought this almost-all-plastic rocket at Hobby Lobby on clearance. Boy, is it a dog. 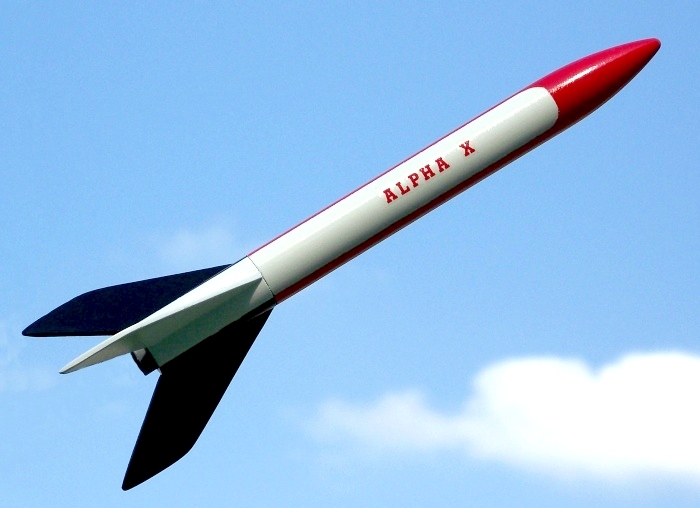 The only thing I can say nice about it, is that I can launch it in my tree-lined back yard with little fear of losing it to a tree... I think I can climb that high on my stepladder. 05/05/2008 A10-3T, did midair loops, ejected after impact, undamaged. Here's my Mini Centurion. I really like how this one came out. 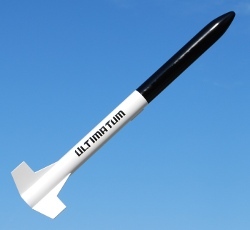 I've added to the recommended engines below based on my experiences with this kit... A rocket that flies well on a B6-4 usually does fine on a B4-4. This is one of my favorite new Estes kits. I built two, one mostly stock (this one) except for a Kevlar shock cord leader connected to the engine mount, and one modified (see below). Here's my modified Mini Max. What can I say? I think it speaks for itself. 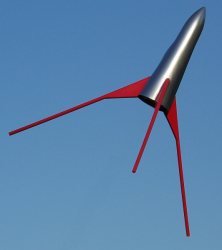 This is an approximate 320% upscale of the Estes Mosquito. 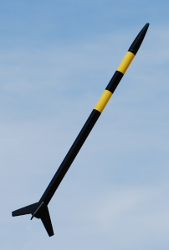 I've seen many such upscales, but this it the only one I know of that uses rear ejection. 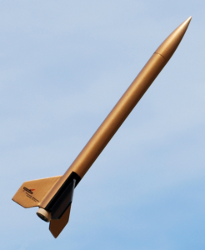 I have a build page for this rocket here. I always loved the look of the classic Centuri Centurion, and this is my semi-clone of that bird. It has a midline break, just above a bypass tube baffle, and it has interchangeable engine mounts (1x18mm, 2x18mm, and 1x24mm D/E). Update 9/27/2008: The E engine mount worked beautifully, but was wrecked when I tried to remove it after the flight. The bargain-basement lower body tube is just a bit too tight. 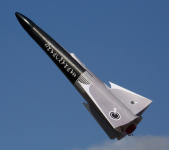 Update 8/22/2009: The lower section of the rocket was smashed on the pavement due to a poor choice of engine. The rocket will be rebuilt. 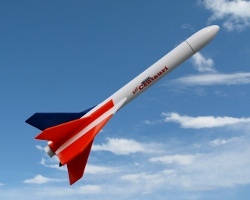 Update 04/13/2011: First flight of the rebuilt New Centurion was a success! I have a page describing this build here. Note: Values below are based on an old RockSim simulation; OpenRocket gives different results. See the build page for details. 08/22/2009 B6-4, deployment failure, wrecked. I cloned the classic Centuri Nomad using parts from Semroc, but I just couldn't bring myself to do the "standard" paint job. This is the replacement for my previous Nomad. I used a random sampling of decals from other rockets rather than getting a "proper" Nomad set, but I don't think it looks bad at all. 09/20/2015 B6-4, chute failure, fin cracked, will fly again. I cloned the classic Centuri Nova using parts from Semroc. The "catalog" paint job for most of the time this model was available was a bit hard to determine, since the catalog pages were black and white; the 1974-75 catalog shows it yellow and red, but the packaging showed it yellow and green. 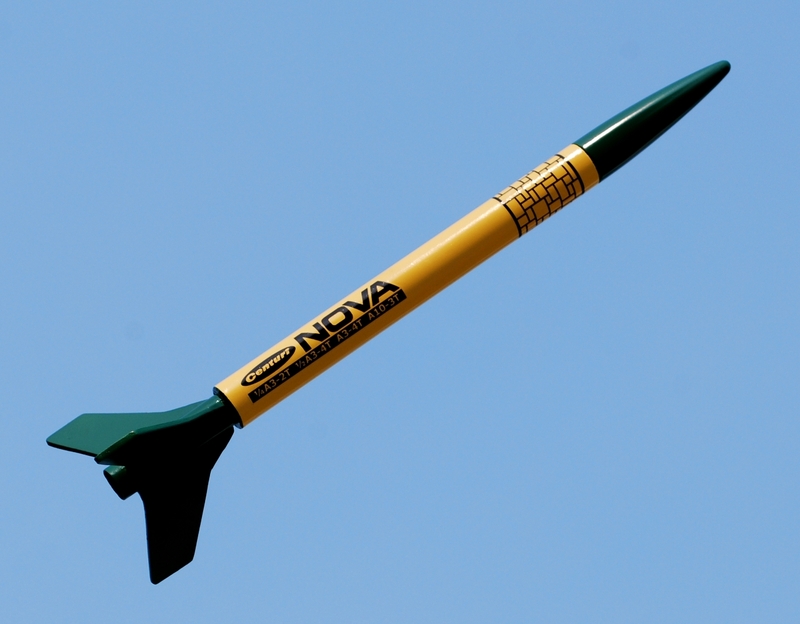 I painted my original Nova yellow, white, and green back around 1979 or so (as shown in my gallery, just past halfway down). As you can see, I went with just yellow and green for my reproduction, but I didn't use standard decals. Instead, I made my own decal set including a roll pattern based on a doodle I sometimes do when I'm on the phone. Recommended engines below are my recommendation; the original recommended engines aren't made any more. I bought this portly bird from Hobby Lobby on clearance, $4.68 each (and I bought two, one of which is still in the bag). I'm not entirely happy with it, but it was a really time-consuming build, so I'll probably give the other one to Justin rather than build it myself. This is the second of two clones of the old Centuri Vulcan I have built (see also the Black Vulcan above). This rocket may superficially resemble the Estes Patriot, but it's much improved; the body tube is a single piece, it has a Semroc baffle, and the engine retainer is a handmade twist-lock. This is one of my own designs; I have a page describing the build here. This is a scratch rocket I built on a whim. I've never simulated it (I don't even have RockSim) so my recommended engines below are just guesswork. Even the name, Phoenix, is a working title. I'm really happy with how the paint and decals went on this one. 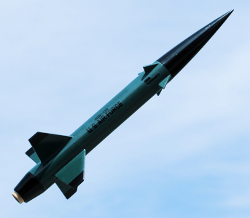 Here's my Semroc Point. I'm looking forward to launching this one in the back yard. 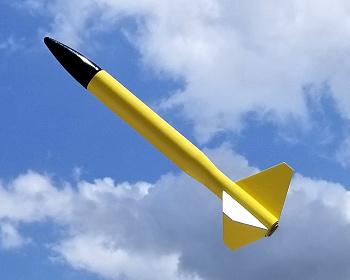 I needed to make the minimum order size from Semroc (I was buying parts) so I threw this one in to fill up the order form. It's pretty simple, but you can't beat the classics. 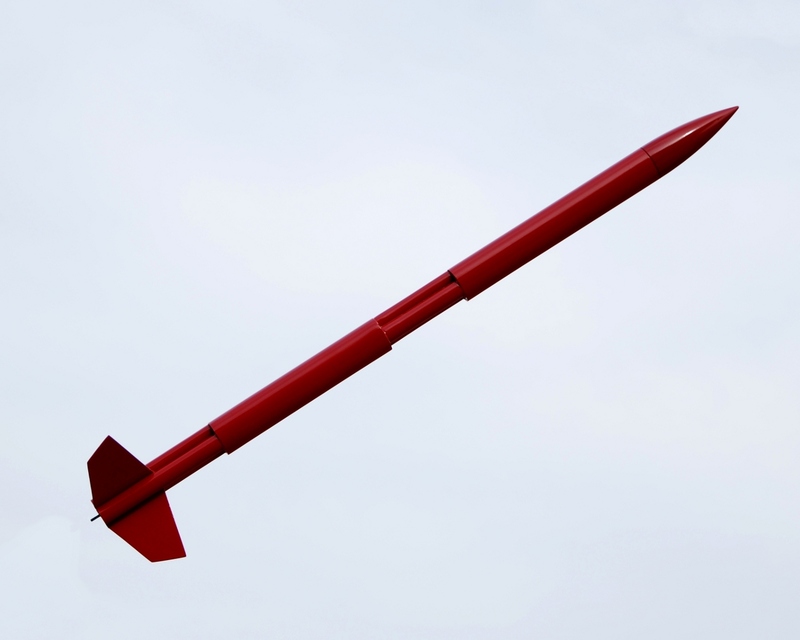 Updated 10/04/2015: So I've had this one for eight years and launched it exactly once. 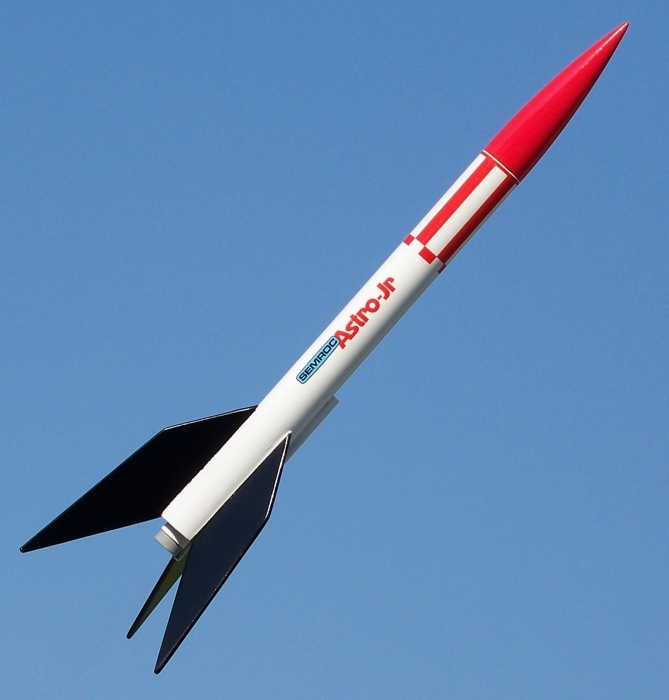 It's not that it's a bad rocket... it's my habits. See, minimum-diameter 18mm rockets don't get launched at my "big" launches because (honestly) they aren't as impressive. 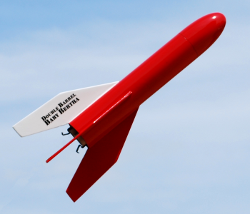 But I do fly small rockets on mini engines in my back yard. So last night I built a 13mm engine mount and glued it in place permanently... from now on, this bird flies on mini engines. 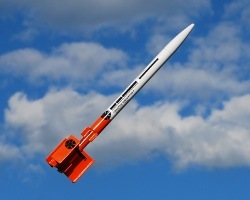 It will get launched next time I fly in the back yard. This sweetheart started life as a Baby Bertha kit. The fins are actually cut from the waste balsa from the Baby Bertha fin set... they are very similar to classic Estes Sprint fins, but had to be sanded somewhat to fit the transition-to-engine-tube angle. The transition is 110# paper, and I used the standard engine mount centering rings to center the BT-20 lower tube in the short piece of BT-60 upper tube. I picked this up at Schaeffer's in St. Louis. It took me so long between building and finishing that I forgot it was Russian and painted it in US colors... so I mixed and matched decals and called it good. 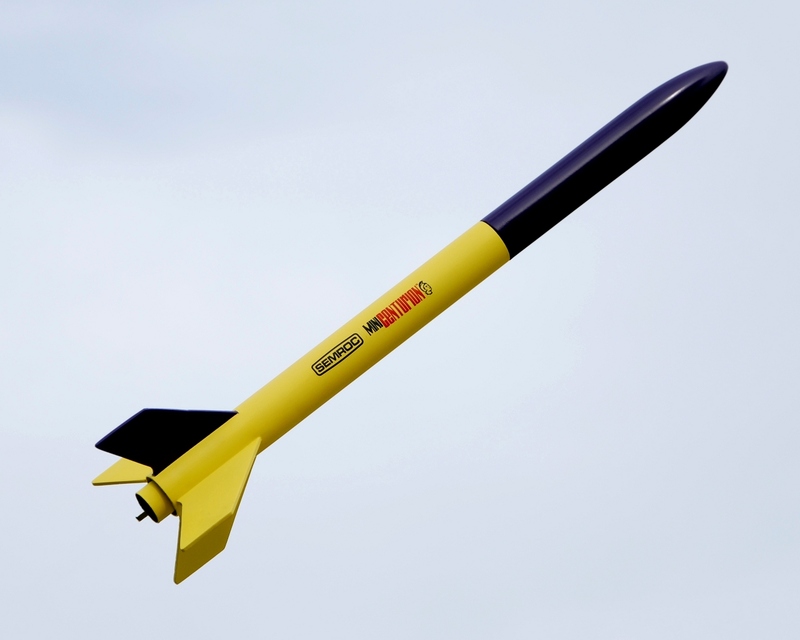 I built this one back in 2015 when I first started as a project leader for the Clark County kids, but I didn't get to launch it until 2017. I built this one on a whim, in a single evening, based on the plans for the classic Estes S.C.R.A.M. mini-brute. The 140 is the upscaling percentage... it's 140% of the original, and thus flies on 18mm rather than 13mm engines. I got back into rocketry in the Spring of 2006, and this is one of the first kits I bought. I got it and the Star Dart, below, in one of those Wal-Mart "Launchables" special packages. It's a pretty good deal, actually, just about $9.00 for two kits. I painted this one using an off-white Krylon paint as a "primer." (I was out of Kilz primer, which I have subsequently sworn off of anyway as it is just too expensive). After getting things pretty smooth, I used some leftover paint from my wife's projects. She even suggested the color scheme. 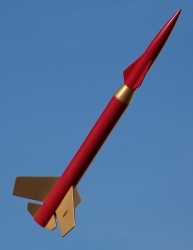 Frankly, I wasn't sure that gold fins would look right on a plum-colored rocket, but now I really like it. This rocket dates back to somewhere around 1977-1978. It was a 4-H project, and it went to the Missouri State Fair (and got a white ribbon, which obviously isn't saying much). It came back with one fin broken at the narrowest point. When I dug it out, I knew I had to refurbish it. I sanded and papered all the fins, which helped to reinforce the one I had to glue back together. 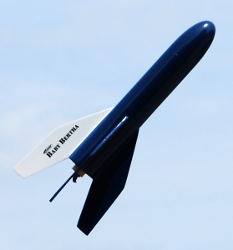 After a thorough priming and sanding, I painted the sustainer blue and red, and the fins and nose cone white; then I cut little stars from blue painter's tape and applied them to the rocket. 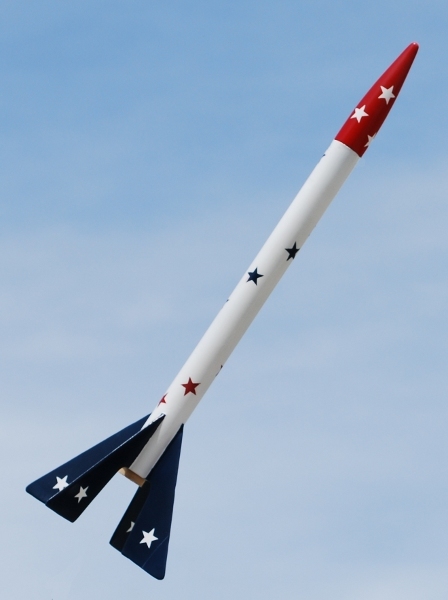 I painted over them, making the sustainer white, the fins blue, and the nose cone red; removing all the little stars gives the patriotic results you see here. A topcoat of Future and the deed was done. The picture here also shows the vintage Centuri parachute, which just needed the tape discs replaced to make it serviceable. 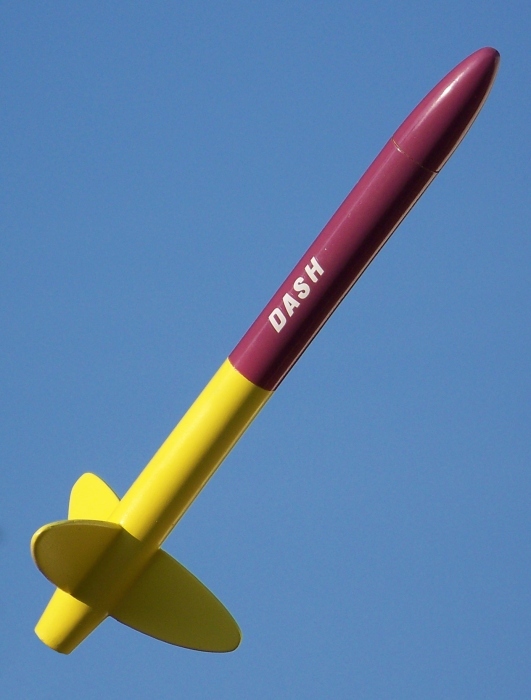 First launch after refurbishment was July 1, 2007. This is one of my designs. I don't recall the inspiration anymore... just wanted a nice-looking 2x18mm cluster rocket. 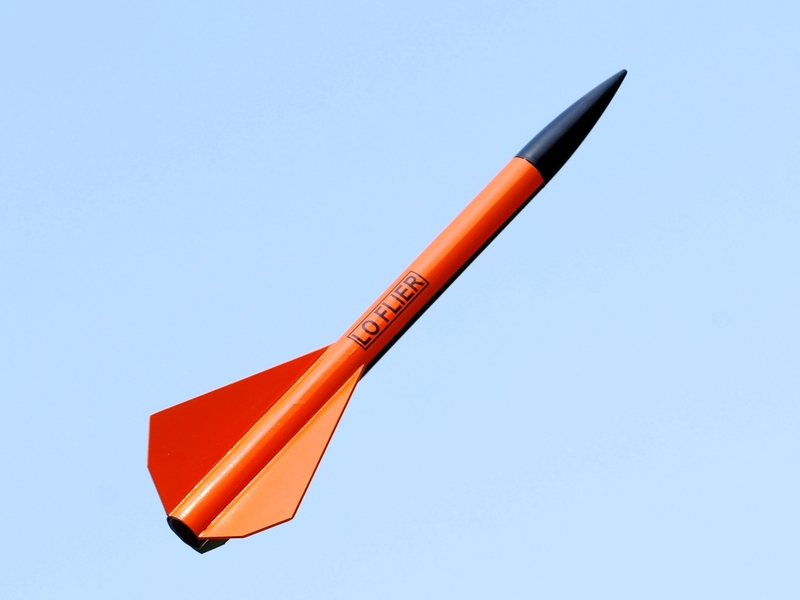 OpenRocket indicates that it has a really nice flight profile with all the engines I recommend below, and I have to say: so far, so good. This is my own paper rocket design, which is distributed from this very website (click here for details). The first prototype blew out its "nose" on its first flight (ending its career) but I have another waiting in the wings. Here is another rocket dating from around 1980. As with the Alpha, above, this rocket needed to be repainted, and the recovery system was replaced. I'm not 100% happy with the paint job, but I'm out of the mustard-colored paint the nose is decorated with, so I believe I will just live with it. I've become a fan of the forgotten, unloved rocket kits of the past. 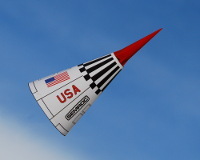 One such rocket is the FSI Sprint, a parachute duration kit made from 1970 to 1996. I consider mine a "semi-clone" as it is not exactly like any of the versions of this rocket sold by FSI "back in the day" but rather combines and averages their features. I have a build page for this rocket. I got this kit during the Quest clearance at Hobby Lobby. 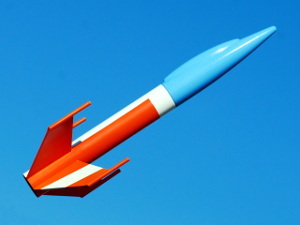 After losing a silver-colored rocket, I decided to paint this one florescent orange; later, I added the blue section at the tail. The orange is Krylon, and the blue is Wal-Mart's ColorPlace paint. I didn't prime this one per se, just painted it with some off white Krylon I had laying around, and up close you can see the body tube spirals pretty plainly. 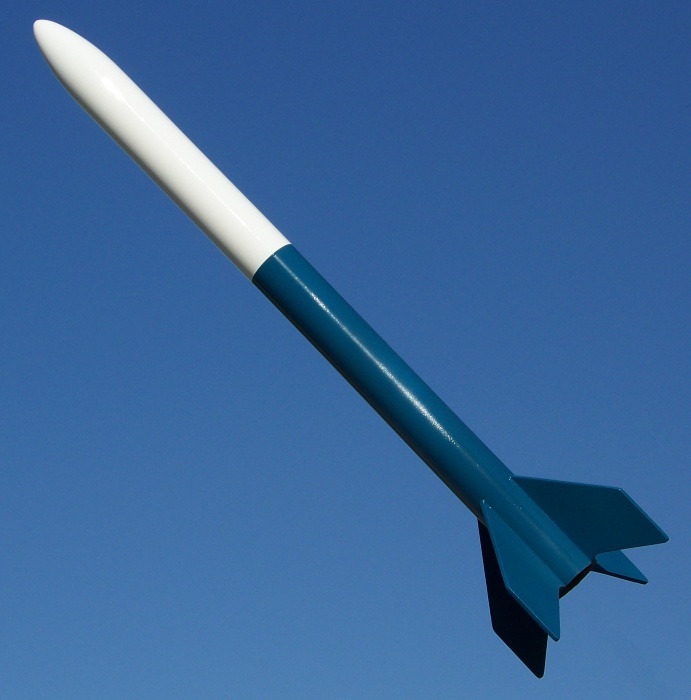 It was one of the first rockets I built after becoming a BAR, and I have to say my finishing skills were decidedly unfinished at that point. 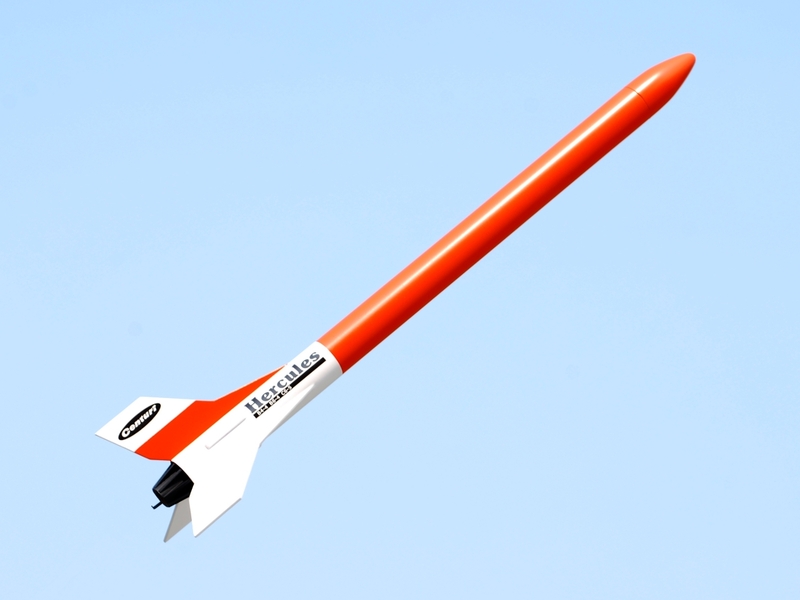 I got back into rocketry in the Spring of 2006, and this is one of the first kits I bought. 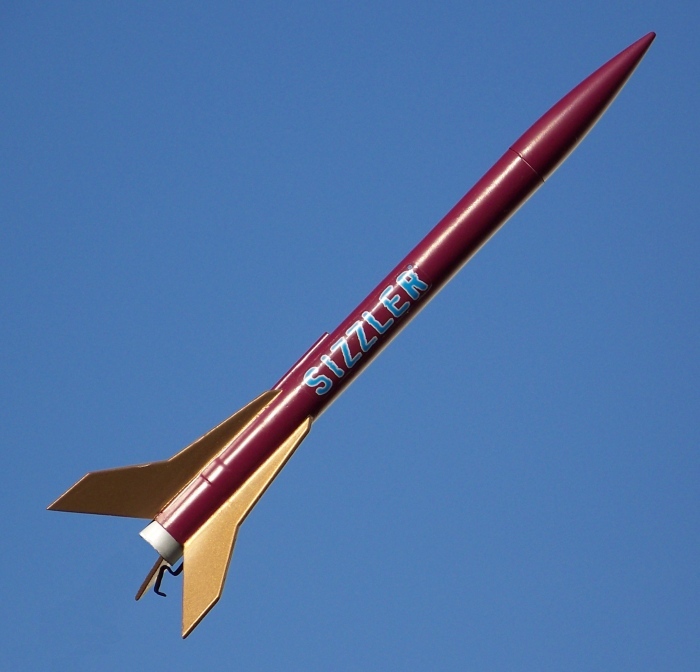 I got it and the Sizzler, below, in one of those Wal-Mart "Launchables" special packages. It's a pretty good deal, actually, just about $9.00 for two kits. I had planned to paint this rocket with one red and two green fins, and to paint the nose cone red. 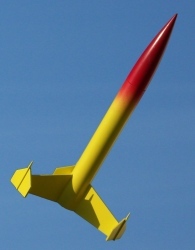 My wife suggested the plum and gold colors instead after seeing the rocket with just the green fins. I was dubious, but I tried it and I think it came out great. 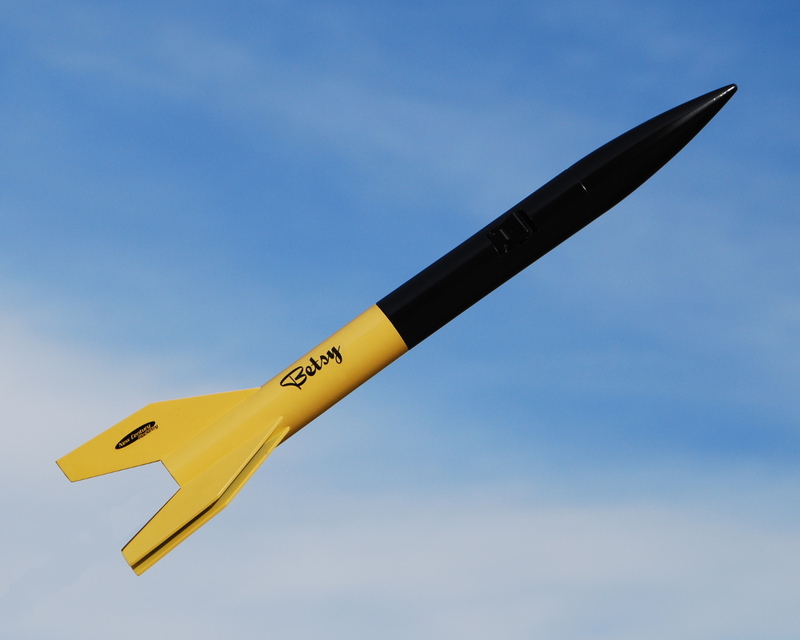 This is one of the last rockets I ordered from Semroc before the company sold. I'm really happy with how it came out. 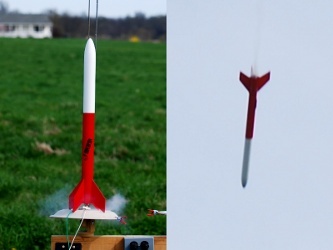 OpenRocket shows that optimum delays aren't really possible with Estes engines (though the B6-6 isn't too bad) but Quest A6-4's should be very nearly perfect. 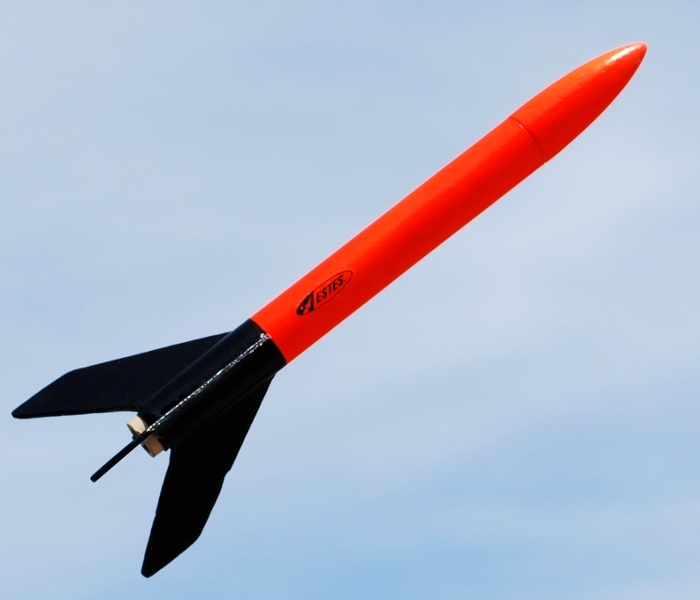 I have a goal of owning at least one rocket from every vendor of low-power sport rockets; the Starliner DST was my choice from Red River Rocketry, and I have to say that I like it. It's a pretty easy build, and given the single-color paint job it's easy to finish as well. Here's my Sunward Starwatcher. I chose the "X Wing" arrangement when I built it; the instructions said I would need "some" noseweight. Gah. 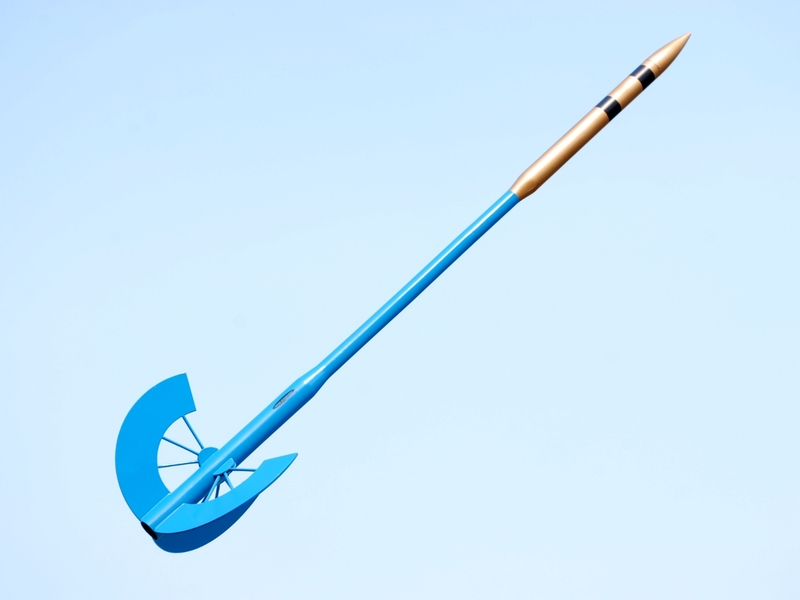 I'm not fond of doing swing tests, as there are too many ways to screw up the rocket when you have it on the end of a string. Fortunately, after some discussion on YORF I've concluded that around 15 grams of noseweight should work. I'm going with 18 computer screws, which have a mass of around 0.77 grams each, combined with enough polyurethane glue to hold them in place. Update: I decided to go with just 15 screws for noseweight. Worked fine (click the launch date below for details). This sad little bird made two flights, and was lost forever in tall grass. This is what happens when a guy who has more 18mm engines than he knows what to do with buys a half price 24mm kit. (Well, one thing, anyway... I also like to put clusters in them.) 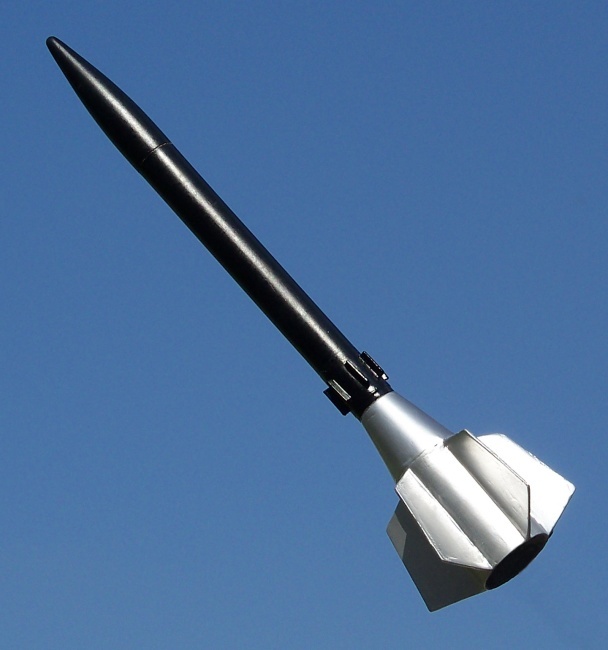 I worked hard to make the tailcone seamless, and I'm pretty happy with it. 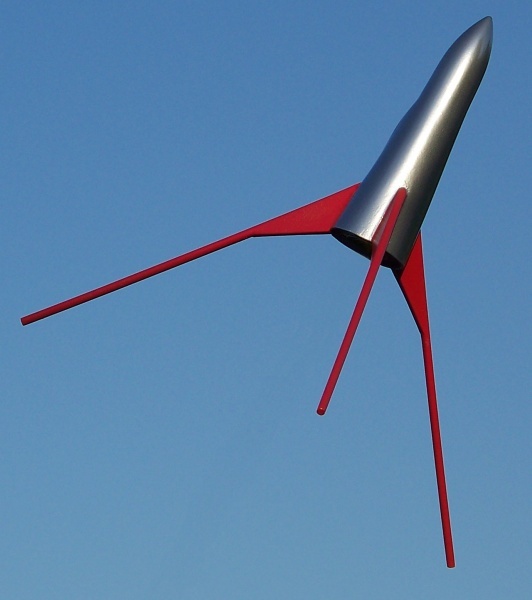 I got this rocket in October 2006 (I think). It was a quick build, though the balsa fins were super-soft, which led to me having to be really careful with it until I got it primed. Then I painted it, first with Kilz Craftcoat yellow, then after a week of curing I taped it up and painted it with Wal-Mart ColorPlace black. It looked really nice. Next, I gave it a nice shiny coat of Krylon gloss clearcoat. The paint bubbled over about half the rocket... I said a bunch of bad words. A week to cure, then I sanded it all off, repainted it, and used Wal-Mart ColorPlace clearcoat. More bubbles... I said a bunch more bad words, gave it a week to cure, and again, sanded it off and repainted it. The third time, I coated it all over with acrylic floor finish. I'm not fond of that sort of a finish, as I think it feels rubbery, but it looks pretty good and it didn't bubble the paint. The first time I flew this glider, if it weren't for my wife's eagle eyes, I wouldn't have recovered it. I flew it "naked" as I have been told over and over that you shouldn't paint gliders. The bare wood turned out to be hard to see in the air. Before flying it again, I darkened the undersides of the wings and the outsides of the rudders (or whatever you call those things) with a marker, which should not appreciably affect the weight. Next, I masked it off and primed and painted the pod only florescent orange. 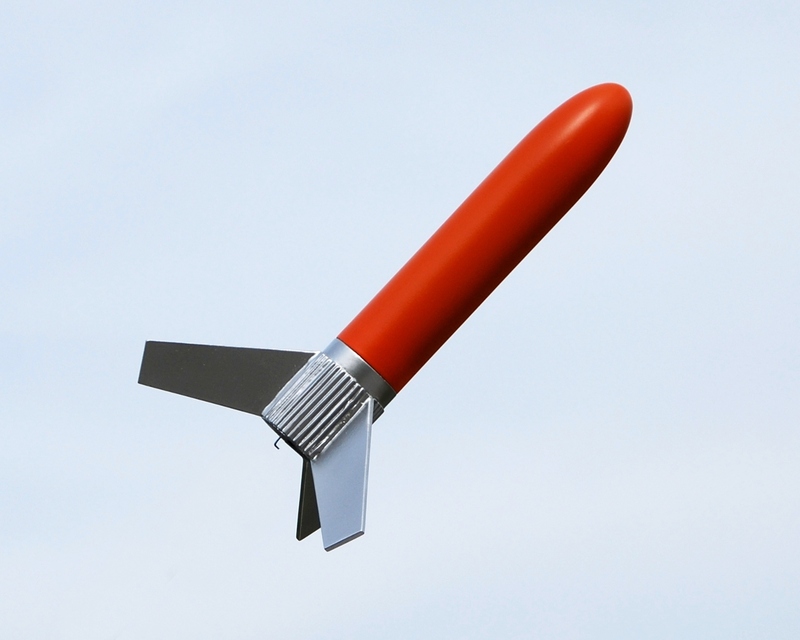 Update: As noted below, on 09/03/2007 I lost this rocket. Not sure if I'll replace it or not. Well, I got it done at last. The paint job on this one was suggested by my wife; it's a base coat of Kilz Craftcoat Yellow with Wal-Mart Colorplace Fire Red on the nose end. I really like the way this one turned out. 05/11/2011 B6-4, road landing, lost two fin tips, repairable. 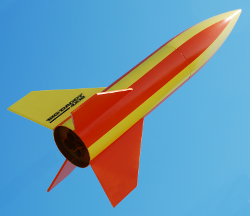 Here's a rocket of my own design. 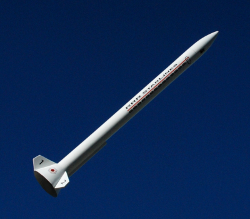 It's a BT-70 sized rocket, with a midline break over a bypass baffle (like my New Centurion, above), and it takes a cluster of three 18mm engines (unlike the New Centurion, which has interchangeable mounts). 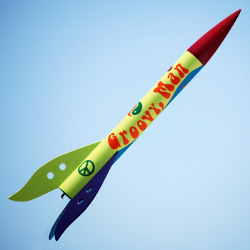 This rocket dates back to sometime around 1977-1978. I did a really rough job building it (but then, I was just a kid). 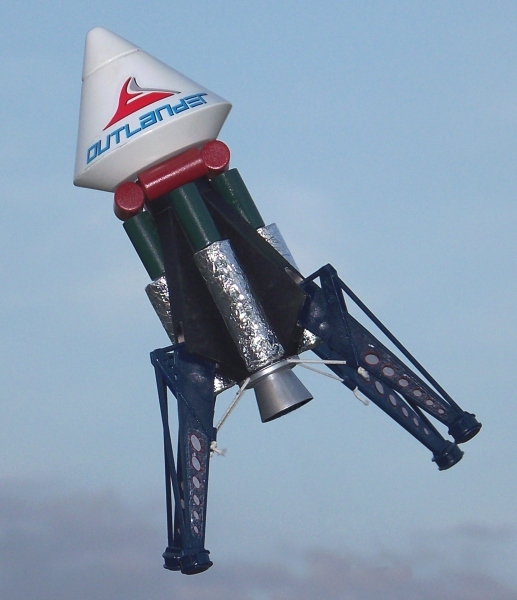 I refurbished this rocket this year (2007); click here to read more. 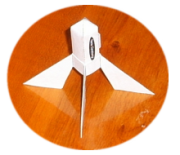 I printed out a set of shrouds for the X-24 Bug, which I'd like to clone; and then, looking at the large number of A10-3T engines I have in stock (bought on clearance at Wal-Mart for $1.00 a pack), I realized a 3/4 scale version of the X-24 Bug might be a good project. So I set the scale to 75% in Adobe Reader and printed another set of shrouds. It doesn't glide. 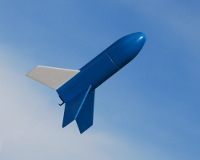 See the launch reports, linked below, for details. However, it's very light, being all paper except for the bulkhead, so I've removed the clay and will be flying it as a featherweight model. The distinctive smoke trail is pretty cool.